Seeing as Cameron, Rocky and I will be based here in Bunbury for another few months I thought it fitting to do a post specifically about Bunbury. Over the last few years of travel one thing seems to have kept consistent with us. Once again we have committed to staying somewhere for a period of time even though we had never been here before. In 2013 we were hired for a tour guide job in central Australia without ever having been there. The same happened last year when we worked a season in the wet tropics. Life is an adventure and we seek it out in any way we can including getting out of our comfort zone. This year not only are we facing winter instead of escaping it to somewhere warm, but we are also staying the furthest South either of us have ever lived, let alone for winter. We have already experienced the coastal southerly winds and they are COLD. Being a traveller though, we are lucky, and we live in a beautiful country. All areas are worth exploring, and experiencing. Bunbury does seem to be a nice place to stay for a while. It could be referred to as a central hub. 2 hours North of Bunbury is Western Australia's state capital, Perth, and just over an hour South of Bunbury is the Margaret River vineyard region, and don't forget Bussleton that Cameron wrote about too which is only 45 minutes South or some of the national parks close by that we will write our adventures soon. There are plenty of day tours leaving from Bunbury to allow access to explore the region. You don't need to escape Bunbury to have a relaxing time. It is classed as a city, but it is a small city spread out city. It has all of the essentials, with a variety of shopping centres but without all of the hustle of a big city. It is coastal with a variety of swimming spots, the two most popular are Koombana Bay and Back Beach. There is farmland. There is bushland. One thing about Bunbur I have noticed is that it is flat which is great for walking, riding a bike or even roller blading. Being from Newcastle which was a city built on one giant hill, I think it is great! When learner drivers do their driving test, they all go to the same hill for their hill starts. The City of Bunbury has made use of this flat advantage by having many and a variety of walking tracks and footpaths throughout the city. Some also have board walks that extend over the water, reeds, and mangroves. On some of the walks there will be a sections that you see the city or suburban areas, but they change quickly back to suddenly to be surrounded by nature again, the noise returning to a natural sound of birds chirping, frogs croaking, and wind rustling. At the information centre there is a a small booklet that has the walks and maps in there. If you ask the locals on things to do you will probably here 'The Tuart Walk' or perhaps 'The Mangrove Board Walk'. Our favourite walk though is along Back Beach, just feeling the sand on our toes, the wind in our hair, and listening to the ocean. There is a fair bit of wildlife to be seen at Bunbury. During some of our walks we have seen some unusual and pretty looking birds. Bunbury Wildlife Park is in town where you will see native Aussies such as kangaroos, emus and cockatoos. If you have not had the opportunity to see these animals that are unique to Australia, or if you have children it is worth a visit. Feeding the animals is always a delight for the children. Dolphins are also a common site here in Bunbury, so much so that there is a Dolphin Discovery Centre. The centre itself is a mini aquarium with a variety of small marine life. There is information about dolphins, and the animals they help to rescue. Feeding the animals occurs a couple of times per day to which visitors are invited to watch. Entrance to the centre is valid for three visits. If you are feeling a bit more adventurous they run an eco cruise all year round, (times of the day change depending what time of year you are visiting). During the summer months of October to April, swim tours are also run. I haven't been lucky enough to see the dolphins yet at Koombana Bay, but I am not a morning person and I am told by the staff at the centre that they are more likely to be present in the morning. But I have seen many dolphins over the years in different parts of Australia. Just down the road from the Bunbury Wildlife Park and across the road from the big swamp is the Accessible Playground. It is quite large, but the best thing about it is that children in wheelchairs can have just as much fun here as their siblings and mates. I have seen this attempted before, but quite often the only point of inclusion is a wheelchair friendly swing with nothing else. However the Accessible Playground has a variety of activities that a child in the wheelchair can enjoy with others, and that is something that is very important in a child's development, to be able to play with their friends not just play alone because they are confined to a wheelchair. It is great to see. Gnomesville: a city for gnomes! G'day to all our readers. Our last post for 2015 mentioned that us Trooprock Aussies are starting a new kind of adventurous way to travel Australia. We still have Rocky, and she still takes us to some wonderful places. Our new way to travel Australia is to house sit as well as camping in between house sits. We have had a couple of smaller 2 week house sits, but we have landed ourselves a 6 month house sit in Western Australia. The last couple of months on the blog have been about our journey across Australia from East to West and the crossing of 4 states; NSW, VIC, SA, and WA. We are now house sitting in a city called Bunbury two hours south of Perth until September. Our posts from now until then will be based around the South West area of Australia and Western Australia. The blog posts may become shorter, but we will still strive to publish a weekly post on Wednesdays. We have already posted about Perth, but seeing it is a city we may end up posting more about it at a later date. The region has many breweries and vineyards so we may do a couple of posts about these too. Today our adventure starts about half an hour East of Bunbury where lies a tiny little place called Gnomesville. It is the classic story of a gnome who moved out to the country to form its own little piece of paradise in the hollow of a tree by a round-a-bout nestled away in the Ferguson Valley. Soon the gnome grew lonely and invited some mates to come and live out in the country for some company. The other gnomes soon also realised the beauty of this little piece of paradise and word spread quickly among gnomes from all over the region then all over the world. And so it is that the sleepy little county tree hollow soon grew to become Gnomesville, a city for gnomes. If you know anything about gnomes you would know they are crafty, sneaky, mischievous and most of all smart. Their legs too short to be able to walk such great distances. They use us mere unsuspecting humans as a means of transport. They love the outdoors, gardens, and forests. While you are out shopping they will jump into your shopping trolley or basket before you even realise what is going on. Other times they will sit on the shelves looking ever so cute that you simply can't help but take them home. Once an idea pops into the head of a gnome you have no chance to convince it otherwise. Sometimes though they do not like their new home. Perhaps they do not get along with the house hold pets, or maybe they are scared of a basketball smashing them, (remember they are fragile pottery creatures), which leads me to tell you how the Gnomes came to live at Gnomesville. Upon hearing of the delightful place called Gnomesville, gnomes started hitching rides in any way they could. Some gnomes sneak into the car during a family outing, some climb into the taxi to escape the Nursing Homes, while others enjoy going for some adventures first by climbing aboard a tour group bus and politely ask to be dropped off at Gnomesville on the way through. Gnomesville makes gnome villages found in movies such as 'The Smurfs' or 'Gnomeo and Juliet' look rather small so believe me when I say that Gnomesville really is a city for gnomes. It is even complete with schools, community groups, hospitals with intensive care units, and even the local police station. Some gnomes even like to live free if you get my gist. Cameron and I drove out to visit Gnomesville for a visit. It is an unusual but a delightful site to see. There are paths going in all directions full of gnomes, and there must be thousands of them (not an exageration as you can see from the photos). Sadly the gnomes don't always have respect for human property. The gnomes do bring tourism into the area, but just like any other city, there comes a point where the population starts to exceed the boundary lines and new suburban areas develop. The problem with this unique situation is that these new suburban areas of Gnomesville are crossing into people's properties, fences are being destroyed and the ground is eroding. The owners of these properties are scared of liability if someone gets hurt. What these property owners would like is a new fence to be put up by the council, but not just any normal property barbed wire fence, but a permanent fence with hollows for the gnomes to live, but who knows. We all know the councils loves tourism, but it usually takes a bit of convincing for them to put any money into it. Another option is that if you find yourself with a convincing gnome trying to trick you into taking it to gnomesville to find a home, perhaps you can play the same game and trick it into starting its own village. Who likes to live the big smoke anyway? Not us! Perhaps you have a mate who lives on a property who would have the perfect home for gnome. I do! Gnome-atter what your age or back ground, Gnomesville is certainly worth a visit if you are in the South-West region. Wellington National Park is not far from Gnomesville and is also worth a visit. Keep your eyes out for a post here in the near future. We haven't been in WA too long, but we sure are enjoying it. The coast here is awesome, the waters are shallow and calm. Fantastic for snorkelling, fishing and enjoying the underwater life. Busselton is a town located about 200 ks south of Perth and not far from the Margaret River region. One of the big attractions in the area is the jetty, I say big because it is 1841 metres long! Not quite as long as the Lucinda Jetty, but it does happen to be the largest 'wooden jetty' in the southern hemisphere. Biggest downfall about the jetty is that the council does charge if you want to utilise it. Luckily it is only $3, so not too bad! They also offer a sea walk thingo where you put on a space man helmet and walk around underwater. A little bit like scuba but more fancy, of course, being more fancy means it costs more $! There is also a train track which goes along the jetty, so if walking 2k's out and 2k's back seems a little too much for you, enjoying the jetty is still an option! You don't need all this fancy stuff to enjoy the jetty though, with snorkel gear and entering the water straight off the beach you can swim along the jetty and see plenty of sea life. Heaps of colourful coral and sea life hang around the pylons, whilst old parts of the jetty that have fallen are home to a variety of beautiful cephalapod. I really enjoyed my snorkel here, witnessed a small shark tackle a sand crab, squid darting away from the weeds, I even had a massive school of salmon power straight by me at one point! I only swam about half way out before deciding to swim back in, a couple of k's in the water is enough to see heaps of wildlife down there. Once you have had your stroll over the jetty and jumped in the water, you've pretty much done the Busselton jetty right? Wrong! Head out to the small regional airport just out of town and see the place from the sky! 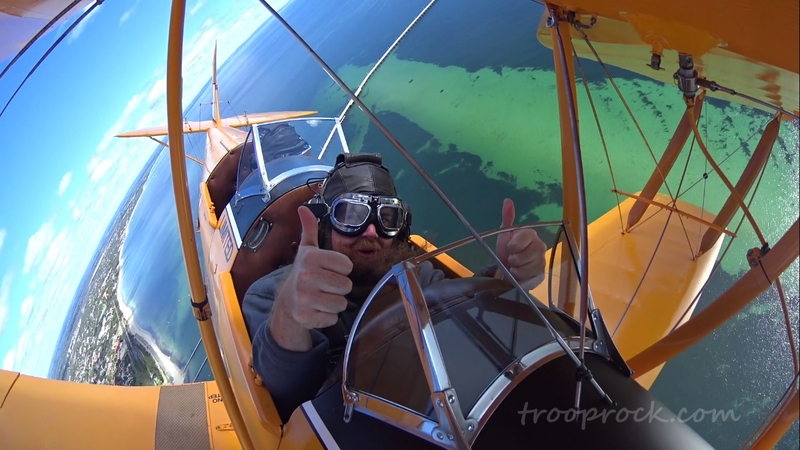 There is a skydiving club which do tandems on the beach, but another really cool way to enjoy this place from the sky is in a Tiger Moth! The Tiger Moth biplane has an open air cockpit and was the key aircraft for the RAF in WW2. Today these beautiful warbirds are a collectors item and provide an incredibly unique flying experience. Tiger Moth Adventure Flights specialise in offering these unique experiences and I couldn't imagine a better way to see Busselton from the sky. As you can see, that water looks spectacular from within and above! If you are really lucky, you may even spot one of the rare Busselton mermaids frolicking around the jetty. Perth, the 4th largest city in Australia and the capitol of Western Australia. We certainly aren't city folk, but after we discovered we were heading into the south west right before a public holiday weekend we decided to find somewhere to stay asap! Not too far from the city we parked up at the Discovery Caravan Park in Forrestfield. As I said before, not city folk, so more than happy to use public transport rather than have the hassle of driving around looking for a park. Perth had a similar vibe to most big cities, big towers, lots of people and good public transport. We wondered around for a while aimlessly just looking around and browsing the shops. At one point there was a trendy clothes shop in the mall with a massive line up, security and all that. No idea what was going on there, but occaisonally the loud screams of excited teenage girls erupted through the streets. Must have been one of them Beibers or something. Elizabeth Quay is looking nice and modern with street vendors, music, charter operators, pubs and resturaunts lining the place. After scouting out the city we decided to check out a Titanic Exhibition that was on town. It was full of stories and acounts from different angles, info on how the crash occured and was full of old relics. My particular favourite was this cigarette dispenser. I don't smoke, but if I did, I'd carry one of these everywhere! Alcoholic? Nup, just need some smokes! Some of the information reguarding truth and myth was pretty interesting, especially with the way the lifeboats were initially used and some of the possibly tall stories. A story tells of the ship sinking and one Frenchman literally thinking "Bugger standing here waiting for the ship to sink!" and swam off to one of the first life boats launched, one with barely any passengers on board. Another story I particularly liked was one about a couple honeymooning, promising the husband's mothers they would not travel by sea as it brought bad luck. Well they made a bunch of letters and got their buttler to send them off while they went on their voyage. She survived, he did not, and even after news reached the family, the loyal butler, unaware of the disaster, continued sending the pre-written letters. We had also heard about "Sculptures by the Sea", a free art exhibition at Cottesloe Beach just south of the city. We jumped on a bus and headed on down there. Cottesloe is a pretty location, nice clean beaches with cafes, resturaunts and pubs lining the beach. Add the fact it was the first weekend of the exhibition and a Sunday before a public holiday and you'd understand the place was pumping, completely packed with people! Once we were done and back in Perth we decided to grab some grub, conveniently there was a pub with a catchy name. We ended up skipping the Lucky Shag in preference for the Aqua Bar where we ended up having a few sneaky beers over some "polenta chips". Yeah I'm fancy alright, I eat polenta chips and look at artwork! Perth is quite an interesting city and there is a bit of something for everyone. We are enjoying our experience in Western Australia so far and can't wait for more fun and exciting adventures!